Shivam Bansal, is a data scientist with exhaustive experience in Natural Language Processing and Machine Learning. And he have an amazing blog post about Natural language processing. So if anyone is interested please check his work out, they are super informative. And today, I’ll try to answer some of the questions from his 30 NLP questions from this blog. Also, I am not going to answer the questions in numeric order. And for every question I’ll try to find the right answer and link them. However, I am always open to learning and growing, so if you know a more optimal solution please comment down below. Q1) Which of the following techniques can be used for the purpose of keyword normalization, the process of converting a keyword into its base form? So keyword normalization is a processing a word (keyword) into the most basic form. One example of this can be, converting sadden, saddest or sadly into the word sad. (Since it is the most basic form) Knowing this now lets look at the options we can choose from. As seen above, we know that Levenshtein is used to measure the similarity among different sentences and Soundex is used to indexing words by their pronunciation. Hence they are not appropriate tools to use for keyword normalization. 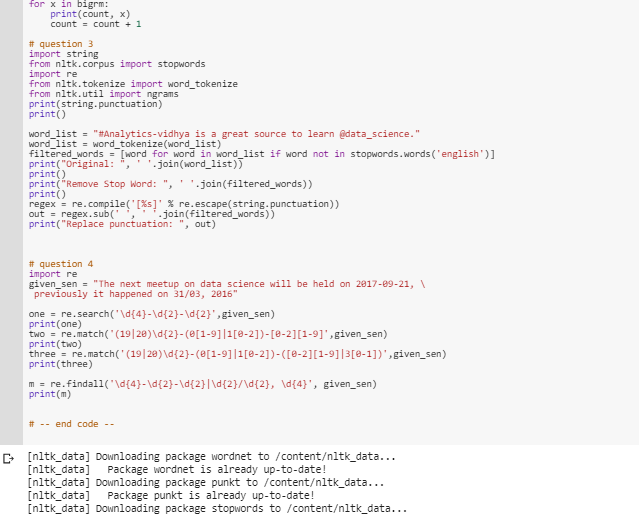 Finally, lets actually look how this looks in python. As seen above, we know the word studies/studying have changed to studi or study after stemming/lemmatization. And we can confirm our solution is correct. I first needed to answer the question what an N-grams is, and I found one stack overflow question that gives an excellent answer to what exactly an N-gram is. So assuming that we are not using # (word boundary), below are all of the combination of bi-gram we can generate from the sentence “Analytics Vidhya is a great source to learn data science”. [“Analytics Vidhya”, “Vidhya is”, “is a”, “a great”, “great source”, “source to”, “to learn”, “learn data”, “data science”]. Meaning there are in total of 9 combination of bi-gram. Now lets look at the implementation. Finally, we can confirm our solution is correct. We already know what a tri-gram is (from question 2). Now lets take a deeper look at what stop-word removal is as well as replacing punctuation. From one simple google search we know that stop word removal is the process of removing words such as ‘is’, ‘a’, and ‘the’. Now we need to replace every punctuation to single space. 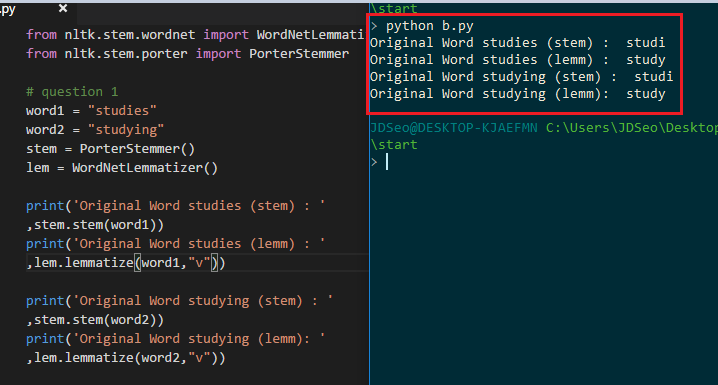 For this we need to know what punctuations are available in python string library. And we can get this by doing something like…. Finally, lets create our tri-gram which gives us the list of words [“Analytics vidhya great”, “vidhya great source”, “great source learn”, “ learn data science”] which have a length of 5. (Giving us the answer c). Now lets take a look at the implementation. From above we can see that we have gotten the same sentence “Analytics vidhya great source learn data science”. This is a tricky question (at least for me), but with simple implementation we can see none of the regex matches the dates. Q5) Which of the following models can perform tweet classification with regards to context mentioned above? Before diving into this question, lets do a simple review on what a SVM / Naive Bayes is. Without going into the details of each classifiers, we can already tell they are similar algorithms which are used in supervised learning environment. However, our question states that we have only collected tweets and nothing more (I would assume these are the label data.). Hence none of them, but if the labels were included I think we can use both of them. Than the answer would be both of them. Q6) You have created a document term matrix of the data, treating every tweet as one document. 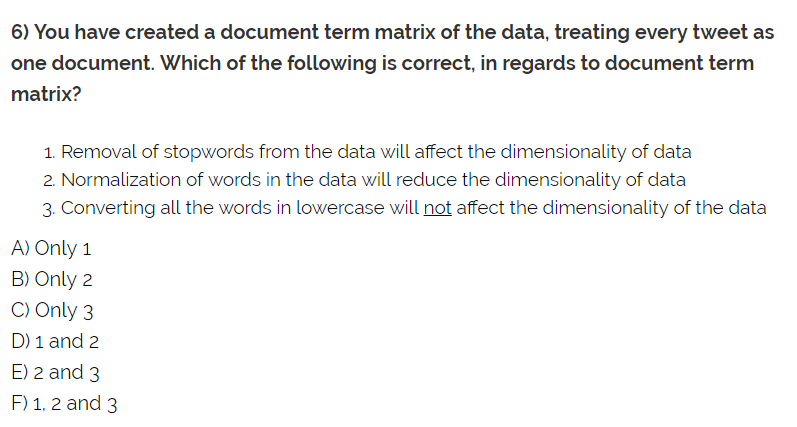 Which of the following is correct, in regards to document term matrix? All of these options seems correct to me for now, but lets dive deeper into what a document term matrix is. From the two images above we can get a idea of what a document matrix is. I would simply call it as a easier method to represent text, or sentence. (In a vector form) Now, lets go over the options, removing stop-words means removing words such as ‘is’ hence it would be considered as dimensionality reduction. I understand normalizing as keyword normalization, converting studying into study etc. Hence if we have two sentence with words studying and study it will be both represented as study hence dimensionality reduction. Finally I think converting all of the word in to lower case is still a dimensionality reduction, since it reduces the number of words we need to represent all of the sentences. Therefore, I think the answer is D). To access the code used in this post please click here. These questions are really a good place to start NLP. Not only I am able to practice implementation but also gain some theoretical knowledge. 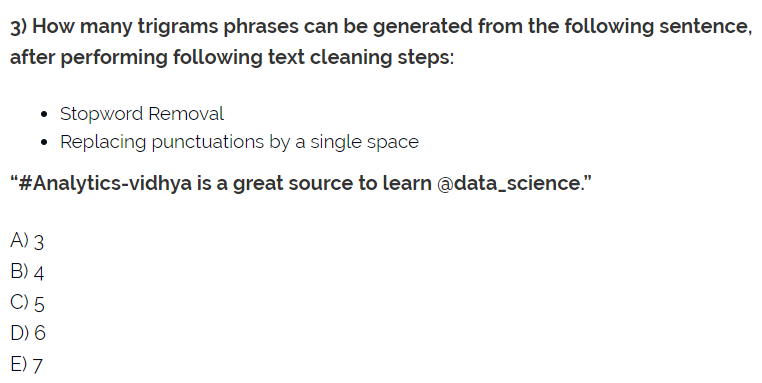 [online] Available at: https://www.quora.com/How-do-I-remove-stopwords-from-a-file-using-python [Accessed 25 May 2018].